(SPOT.ph) Admit it: Eating healthily can be a struggle—even more so when you’re constantly on the go. 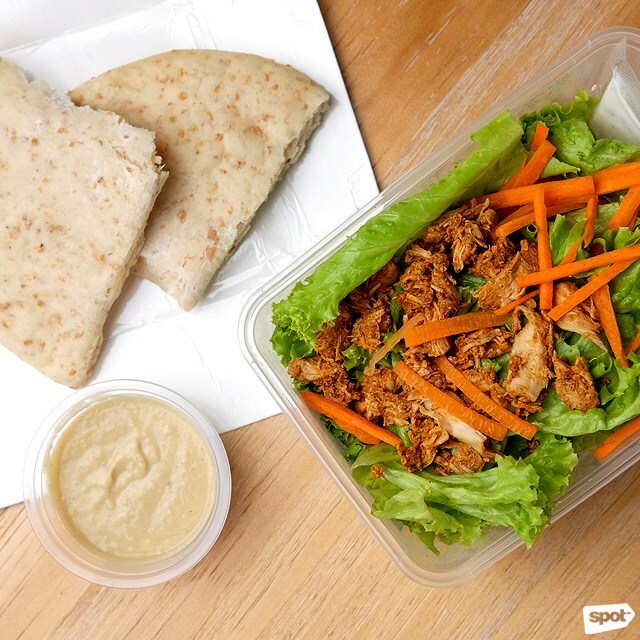 But with the birth of online-delivery apps, you no longer have to wait in line for your wholesome-food fix. Now, having that juicy burger for lunch won’t make you feel too bad because you can have a colorful grain bowl delivered straight to your door for dinner. We’ve listed some places where you can make this happen even with just a few taps on your phone! The Corner Tree proves that eating nutritiously doesn’t mean just eating salads. This low-key restaurant on Jupiter Street and Power Plant Mall takes classic Filipino dishes like lumpia, adobo, and even sinigang and makes them vegan by substituting meat for veggies like tofu. The Corner Tree also boasts vegan pasta on their menu if you're craving lasagna or spaghetti. 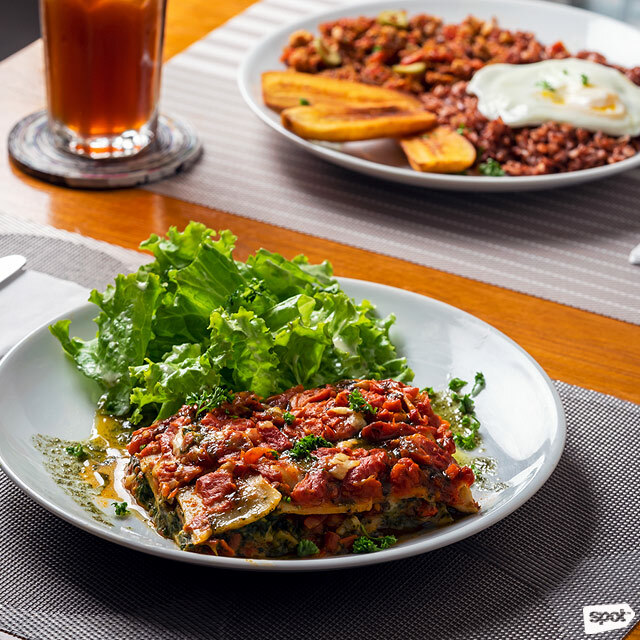 Try out their Spinach and Mushroom Lasagna (P550), a tangy tomato-based dish made with mushrooms, bellpeppers, and three kinds of vegan-friendly cheese. If you aren’t a fan of greens (like most of us), Go! 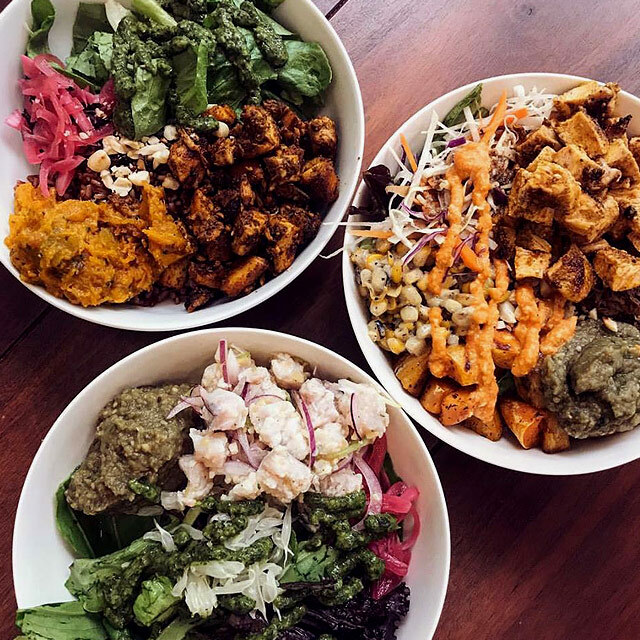 Salads’ line of veggie bowls might just make you rethink your aversion to vegetables thanks to their tasty salads with toppings like longganisa, adobo flakes, and even seared steak. They have a total of nine salad variants to choose from, whether it’s the Filipino-inspired Bayani Salad (P150), which comes with sweet corn, chicken adobo flakes, and a soy sesame dressing, or the Tuktuk Salad (P150), a combination of pomelo, shredded jicama, peanuts, and an Asian peanut dressing. You can pair your chosen salad with any of their panini, or wash it down with any of their green smoothies. Berde's menu is simple and straightforward, offering five signature bowls that highlight Filipino cooking and ingredients. Their best-selling Baka Bowl (P260/regular, P420/large), for example, is a take on the usual adobo flakes and comes with a wide array of vegetable side dishes. For something even healthier, you can opt for the vegan MongGo Green (P190/regular, P300/large), with kare-kare made with mushrooms and monggo. You can also create your own bowl, with your choice of protein, base, veggies, pickles, toppings, and sauce if you’re feeling creative. This new vegan spot in Legazpi Village specializes in falafel, or deep-fried patties made with chickpeas. The crunchy veggie patties are either served in a pita pocket or bowl, with your own choice of toppings and sides, like turmeric rice, quinoa salad, or hummus. They also have a vegan take on the classic shawarma, the Seitan Gyro (P290), which comes with fries, lettuce, tomato and tzatziki made with soy milk. If you’re thinking of what to have for your next healthy lunch, you might want to give this restaurant a chance. 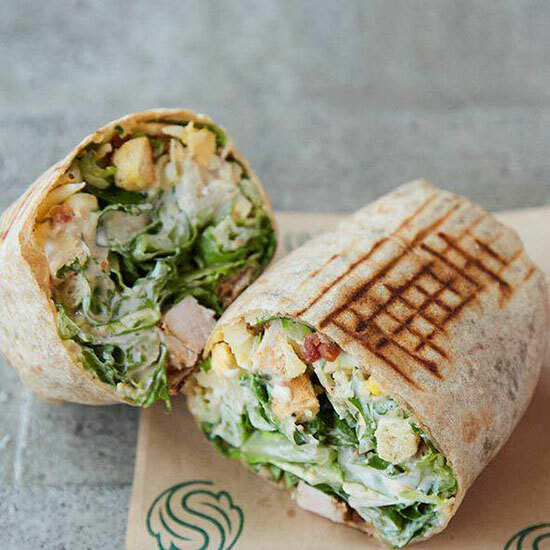 If you aren't in the mood for veggies because the thought of a luscious steak is just too good, then SaladStop!’s selection of wraps and salads might be the push you need. This restaurant takes classic salads up a notch by serving them with their signature sauces and high-quality ingredients, which they don’t scrimp on. Take, for one, the Hail Caesar Salad (P285), with shaved parmesan, grated eggs, croutons, and bacon bits. If you want something more filling, you can also have it as a wrap (P275), add extra protein like grilled chicken, or order their crowd-favorite Carrot Cake (P70) for dessert. If you’re trying (keyword: trying) to kickstart your day with a healthy meal, then The Kismet Café & Wellness Market may be your best bet. 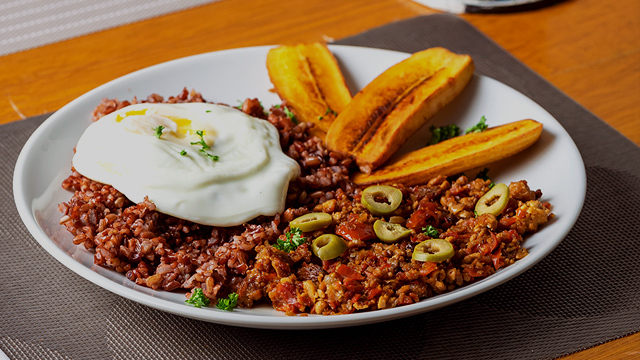 This restaurant offers vegan-friendly breakfast food like Peanut Butter Banana Pancakes (P195) or their full Filipino Breakfast (P295) with vegan tapa, a tofu scramble, and garlic rice. 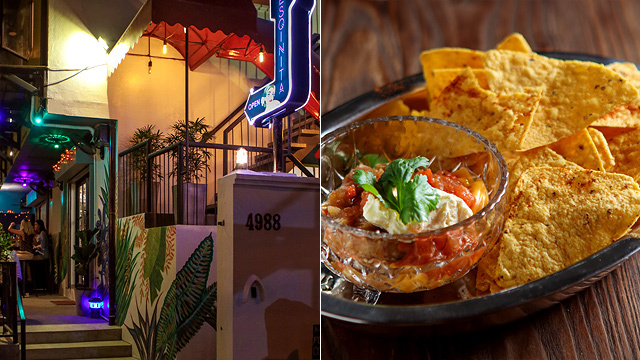 They also offer lunch and dinner options like a Veggie Ham and Cheese Sandwich (P165) and a spicy Carne Asada Burrito (P295), which you can either have vegetarian or vegan. 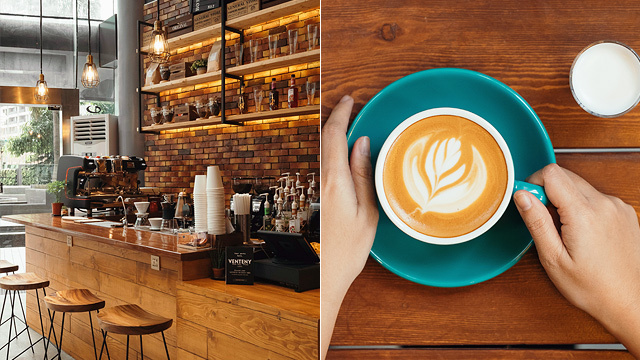 With dishes made with only the freshest and simplest ingredients, this hole-in-the-wall in Poblacion believes that eating healthily doesn’t have to be boring. 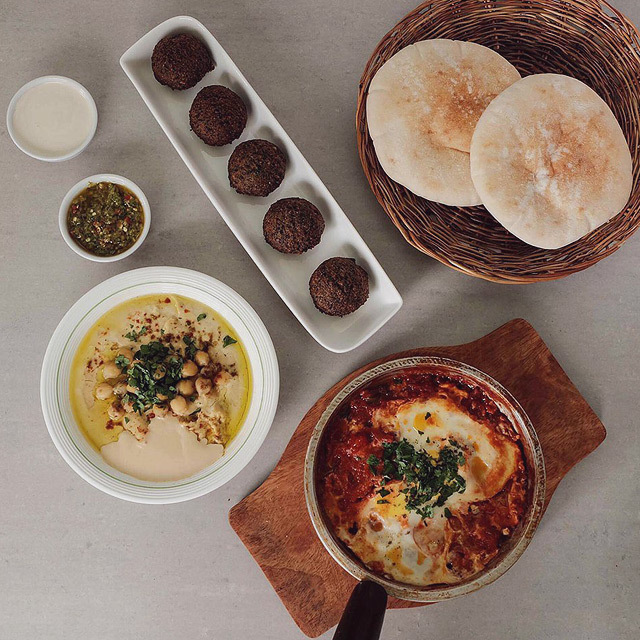 Everything on their menu is vegetarian-friendly, from their signature Hummus (P250) to their wide selection of pita dishes. Make sure to check out their Falafel Sandwich in Pita (P200), with deep-fried chickpeas wrapped in a soft pita bread and served with a fresh cucumber-tomato salad. Don’t forget to ask for their homemade spicy sauce on the side! Located at Pantree Food Hall in Legazpi Village, this fast-food stall offers quick and easy plant-based, vegan meals for cubicle dwellers around the area. Not only are there salads on the menu, but also burgers with Falafel (P150) or “Corned Beet” (P150) patties, rice bowls, and even breakfast wraps. You can also get combo meals, with a choice of potato or sweet-potato fries that can come with a hummus, spicy garlic, garlic, or nacho cheese dip. Vegan-friendly restaurant Green Pastures prides itself on using organic ingredients sourced directly from the country’s best farms. 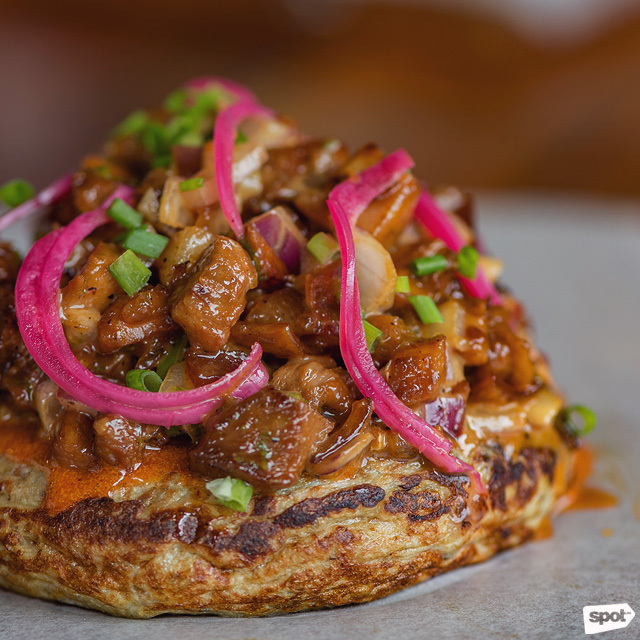 This local flair extends to the restaurant’s menu, replacing meat in traditional dishes like kare-kare and sisig with vegan-friendly options like jackfruit and eggplant. Meat lovers can also find their favorites here. Check out their Buffalo Chicken Meatballs (P325), which features their tangy signature “Happy Sauce” and celery sticks, with blue cheese dressing on the side. This stall at The Podium’s The Corner Market can now bring the farm-to-table experience to your doorstep. Using fresh produce directly sourced from local farmers, Gusto! manages to whip up colorful bowls that are not only pleasing to look at, but they’re also tasty and good for the body. 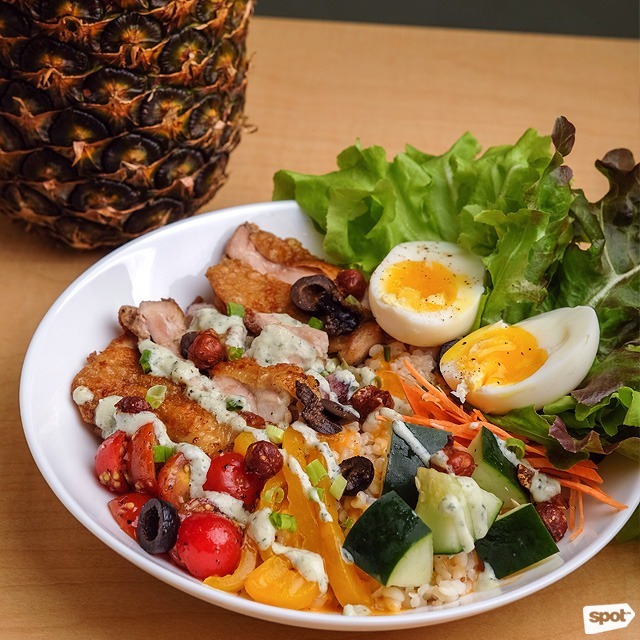 Check out their best-selling Mediterranean-inspired Lemon Yogurt Bowl with Adlai and Chicken (P285), a hearty and healthy meal that can keep you full for the rest of the day.